Worldwide icon-chevron-right North America icon-chevron-right United States icon-chevron-right Illinois icon-chevron-right Chicago icon-chevron-right Banh Mi & Co. 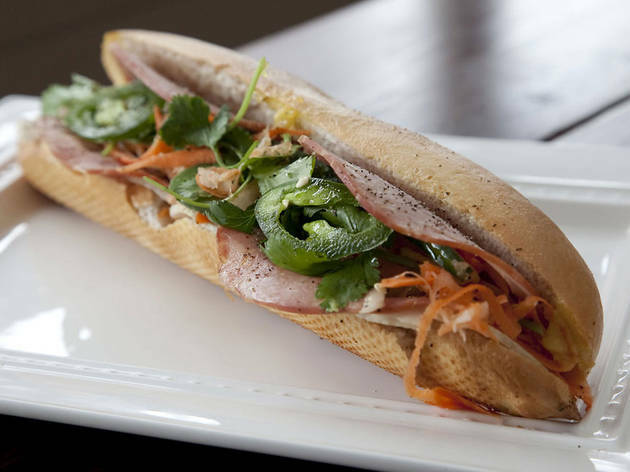 Photograph: Ashlee Rezin Banh Mi & Co. 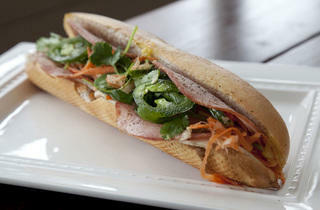 Tired of trekking to Argyle for your banh mi fix? Get to Lakeview instead, where this fast-casual Vietnamese joint modernizes its menu almost to the point of confusion—but delivers nonetheless. Line drawings of animals (a chicken, cow, pig) are to convey the proteins on offer, followed by flavor profiles (lemongrass, curry, etc.) and finally the application (banh mi, rice noodle salad or spring roll). Best bets include the bright lemongrass tofu spring roll, tender curry beef on noodles and the classic banh mi, complete with pâté and headcheese. If any of your cohorts start in with Ba Le comparisons, hand them an ultra-thick Vietnamese iced coffee and tell them to let it go. EL stop:Red,Brown,Purple (rush hrs) to Belmont. Bus:36,77,151,156. Near Banh Mi & Co.